While the San Jose Mercury News made a big deal about a plan to ensure traffic lights will recognize two-wheeled vehicles, I’m not so sure it’s happening in my lifetime. As you get older you find yourself using that expression a lot more often. Apparently the state passed legislation four years ago requiring that all new and modified signals include bike-friendly signal detectors and directed Caltrans to develop a standard, but it never did. Cities and counties are on their own to find the best way to make signals work. Pleasanton is trying out an interesting concept. 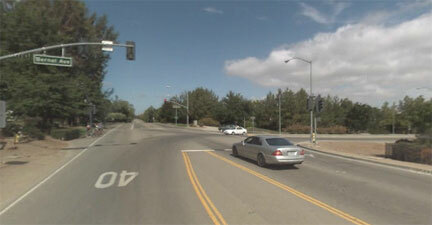 The city, with federal funding, installed microwave vehicle/bicycle detection equipment at selected intersections. The system can distinguish between motor vehicles and bicycles and provides a longer green signal time when bicycles are present. It’s about a million miles from my home to Pleasanton, but I’ll try to ride there this summer and check it out. I occasionally come across signals that don’t recognize bikes, but less and less often. However, there’s one turn signal from Saratoga Avenue to Pruneridge Avenue that has never worked for bikes in the 15 years I’ve been using it. I gave up trying to get it fixed years ago and started going a different direction. I was even a member of the City of Santa Clara Bicycle Committee at the time, for crying out loud, and still couldn’t get relief. This entry was posted on June 23, 2011 at 4:31 pm and is filed under News. You can follow any responses to this entry through the RSS 2.0 feed. You can leave a response, or trackback from your own site.